Welcome to the world of rabbit ownership. It’s joyful, fun, interesting, sometimes very worrying and certainly all-absorbing. Rabbits can make wonderful pets but there is more to looking after them properly than many people realise. The first thing to note is that rabbits are not cheap and easy children’s pets, they have complicated needs. Under the fur, pet rabbits are exactly the same as wild rabbits. If you are thinking of taking on rabbits, please check if rabbits are right for you before jumping in. It’s also worth considering the long term costs. Rabbits are not a cheap pet to keep: they can cost £11,000 over their lifetime. If you have just become a rabbit owner then this page gives you the basics on what you’ll need to consider to give your new pets the lives they deserve. The more you put in, the more rewarding your experience will be. Have a natural diet. This should be made up of 85% hay or grass, 10% leafy green veg, 5% extruded pellets or nuggets (about an egg-cup full). Be healthy rabbits. Your rabbits must be neutered (castrated for males or spayed for females) and their vaccinations kept up to date. You’ll need to register with a rabbit-savvy vet and carry out regular health checks to make sure your rabbits are in good shape. As part of their make-up as a prey animal, when rabbits are unwell they often don’t show it so you need to be vigilant. Wild rabbits live in colonies, never on their own. Pet rabbits should be kept in neutered pairs or compatible groups. Recent scientific research has confirmed that rabbits suffer from stress and loneliness if kept alone: they value companionship as much as food – and you wouldn’t keep them without food, would you? If you have a single rabbit check your local rescue centre for a friend for your bunny. They need plenty of space, including a spacious and safe exercise area that is permanently attached to their hutch or cage. In addition, they’d really enjoy free run of the garden or rabbit proofed parts of the house) when supervised. Cages/hutches should be regarded as burrows to rest in as part of a larger living area, not prisons! In the wild they run about for several hours every day. Rabbits can live indoors as house rabbits, or outdoors in a large hutch that has an exercise run attached to it. There are lots of options: indoor cages of different designs; adapted wooden playhouses for the garden; and various combinations of runs attached to hutches. Whichever you choose, you will need to adapt part of the house and/or the garden for your pets. Check out our housing section for advice on accommodation for your rabbits. Rabbits eat grass (or hay)! Rabbits should be fed in a way that is as close as possible to their natural diet: mostly grass or hay. In fact, rabbits could live on hay and water alone, but we recommend providing some fresh leafy vegetables and a small amount of commercial feed. The long fibre of grass or hay is vital to their digestive, behavioural and dental health. Because rabbits are preyed upon by many other species (dogs, cats, foxes and even humans), they are naturally shy, quiet animals who hate being held above ground level. They do not like to be picked up and carried around, so children should be encouraged to interact with them at ground level instead. Gaining the trust of a rabbit takes time and effort. If your child is looking for something soft and cuddly to pick up then buy a fluffy toy, a rabbit is not for them. Rabbits don’t like loud noises or sudden movements, so don’t terrify your pets with loud music and rowdy games. Keep toddlers away – their jerky movements are very scary to bunnies. Rabbits don’t like being picked up (the only time a wild rabbit gets picked up is if it is about to be eaten by a fox) and they have large teeth and claws, which they’ll use if they are scared or angry. Rabbits need a good vet! Wild rabbits don’t live very long… but a well cared for pet rabbit can live a very long time- 10 years or more. You need to find a good rabbit vet. Even healthy bunnies need to see the vet regularly (just like humans, they need to be immunised against deadly diseases) and if your rabbits are ever injured or ill they will need rapid veterinary care. It’s also important for pet rabbits to be neutered. You’ll need to visit the vet at least once a year for their vaccinations, but it’s useful to have at least one more check-up during the year. 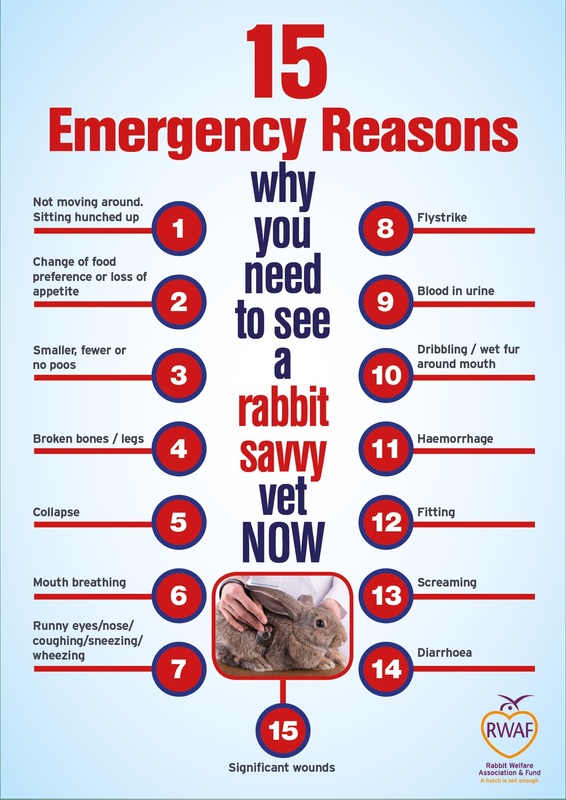 We hope those are the only visits you’ll need to make to the vet, but having a rabbit-savvy vet is vital so make sure yours is. A great vet is your pet’s very best friend. Rabbits love to chew and dig – it’s what they do when making burrows. 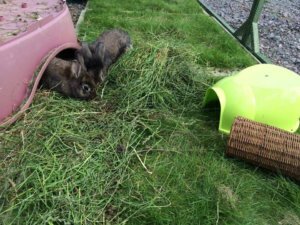 Pet rabbits need things to chew (eg hay; apple or willow twigs; kitchen roll inner tubes stuffed with hay and grass) and somewhere to dig. You can make a “digging box” by putting peat into a cardboard box and cutting a hole half way up the side. Let your rabbits play in a sandpit; or just accept they are likely to burrow in the garden, and make it secure to avoid escapes! Rabbits are inquisitive, and love exploring. This is because wild rabbits always need to know the quickest way back to their burrow, and where to find the best food. Rabbits like to climb into (and onto) new toys. So give them cardboard boxes, large pipes, or bits of rolled up carpet to play with. They also like searching for tasty food, so you can hide titbits and watch your bunnies hunting for them! Rabbits like somewhere to hide – wild rabbits use their burrows both as a safe haven in times of danger, and as a place to relax in safety. Bunnies need a dark hidey-hole where they can chill out in peace. Never force your rabbits to come out of their hidey-hole: they will become frightened of you, and may bite or scratch in protest. Indoor rabbits need at least as much space as they do outdoors. They must be kept safe from any other pets – cats and dogs to them are predators, no matter how friendly they may seem to you. They need to be safe from eating electric cables too, or anything else in the home that might harm them – house plants for example. They should have a comfortable climate, not too hot and not too cold, and they need to be safe from escape when you open the front door. Without making things boring for you or your rabbits, have a routine so that things don’t get forgotten. Breakfast time means rabbit feeding, changing water, some cage/hutch cleaning and checking their bodies for any problems like dirty bottoms. Work out what you have time to do before going to work. Evening may be when you have more time and a full clean of their home may be easier then. Check water again, give them more hay – they can never have too much – check their bodies again, move toys around, check their home is secure and just spend time with them and enjoy their company. Because rabbits are prey animals they will hide symptoms of illness for as long as possible so if you have any concerns about your rabbits’ health then you must seek vet advice as soon as possible. There are two very common illnesses caused by viruses that are fatal for unvaccinated rabbits. They are Myxomatosis and Viral Haemorrhagic Disease (1+2). Wherever your rabbits live they can catch either disease, so vaccination is essential for all rabbits. Vaccinations need to be repeated at least every year. Rabbits can’t catch cold but if you see them looking like they have, that is called snuffles. It’s caused by bacteria. Head-tilt looks exactly as you might expect from the name, the rabbit’s head tilts over to one side and it’s unable to straighten up. There may be a loss of balance, weakness in the hind legs, incontinence and if it’s severe, spinning and rolling. This, and going off their back legs, can be caused by a brain parasite named E. cuniculi, for which treatment is available. Ear infections can also cause head tilt, therefore regular ear checks from your vet are vital. Dental disease is a common problem. Often poor diet is to blame. Rabbits need to eat hay, hay and more hay. Grass is much the same thing as hay, with a higher water content, but grass clippings from the lawnmower should never be fed, as they ferment and cause gastrointestinal disease. Every rabbit should eat its own body size or more in hay every day to keep the gut healthy but just as importantly to keep teeth ground down. So between 80% and 85% of what they eat should be hay or grass. If you find a lump or an oozing spot then it may well be an abscess. These can be extremely serious and need to be treated as early as possible so you must take your rabbit straight to your vet. Rabbits are about as susceptible to cancer as humans are. The biggest risk is uterine cancer in females. This can be avoided completely by having your female rabbits spayed. By the age of 4, the majority of unspayed females will have uterine cancer, so please make sure yours isn’t one of those. You need to budget for the cost of healthcare throughout your rabbit’s lifetime. Make you sure you have set aside funds for potential treatments and consider insurance and healthcare plans. 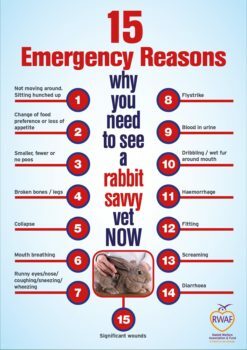 We have a page on emergencies, Review it now to ensure you’re prepared for times when you must get your rabbit to a vet immediately. We recommend taking advantage of all the advice on this site. Join us to keep yourself up to date with everything that’s going on in the world of rabbit care.